After her daughter experiences a terrible trauma, Annie decides the two of them should move to Heron Island to open a restaurant. The success of the restaurant all depends on the sale of the local inn, but the owner, Navy SEAL Will Dozier, has just returned to the Island and doesn't want to sell it to a developer. He does, however, want to get to know Annie. Having read Sophie Moss’ fiction before, I knew not to expect a light, easy going romance. Admittedly, I’m a total softy, but I spent about half this novel crying, both happy and sad tears. It probably didn’t help that I finished it in an over emotional mess at 4.30am because I just couldn’t put it down to go to bed. Annie is determined to rebuild a life for her daughter. She is a passionate mother, but she is clearly struggling to hold herself together. Although her past experiences weren’t something I personally related to (of which I am completely grateful), it was easy to understand this character. One of the things I love about Sophie Moss’ writing is her ability to drag readers into the mindsets of her characters. She has a way of creating an empathic link between reader and character that is hard to escape. On top of this, her characters are so vibrant and real that it is difficult to let such stories, and new friends, go. You really have to feel for Annie, struggling in a new town and desperate to find some peace for her little girl. I felt the same way about Will. A Navy SEAL on leave, Will is struggling with PTSD along with decisions about what he will do with his property. I was a little apprehensive about how Will’s mental health would be dealt with in this book. I’m used to a lot of romance plots that use PTSD (or other health issues) as an excuse to create a caregiver-romance storyline, or stories in which the romance magically solves any mental health problems, and I find this a little problematic. I should not have worried in this case, however, as it was handled incredibly well in Wind Chime Café. Will is a full character with personal demons (including mental health issues) he must deal with, as is Annie, and while they help each other as much as they can, these are character traits rather than the driving force of their romance. I have to applaud Sophie Moss for doing this so well. Their romance is delightful. Being in a small town, there is no shortage of well-meaning busy bodies sticking their noses in, and this is something that Annie has to deal with, but which is all part of the small town charm of this novel. The development of Will and Annie’s romance feels completely natural. I love their banter and the way they related in conversation, even over the sad stuff. When they are together there is definite heat, and the two feel an instant, undeniable attraction to each other, but their love develops through the book in a way that is really beautiful and touching. The star of this novel, however, is absolutely Annie’s daughter Taylor. Having survived a school shooting, she is also suffering psychological trauma, but she has a kind of strength that shines through the novel. Taylor is a little girl who opens everyone else up and allows us to see who the other characters really are. For example, as we get to understand how she deals with the trauma of the school shooting, we are also able to understand Annie more, as she attempts to function as a parent after this tragedy – I cried a waterfall for Annie when, early on in the novel, she drops Taylor off for her first day back at school. The last book I read by Sophie Moss was The Selkie Spell, a fantasy romance, and I adored it, but I think I liked Wind Chime Café even more. Coming from a fantasy-romance addict, this is a big call. 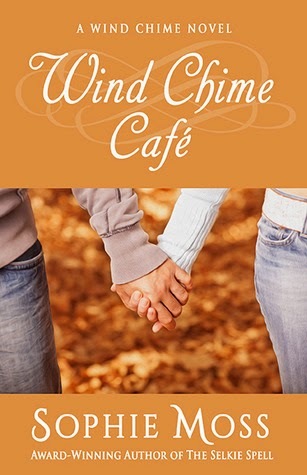 I must recommend Wind Chime Café to everyone, but suggest you keep a box of Kleenex handy! Wind Chime Café was released on February 7 2014 and is available from Amazon.